1. Preheat the grill, place the lamb on a rack and grill for 3-4 minutes each side, for medium. 2. While the lamb is resting, roughly mash the avocado and stir in the red onion, cucumber, radishes and mint, then season. 3. 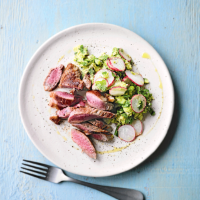 Slice the lamb and serve with the avocado salad, and a drizzle of olive oil.